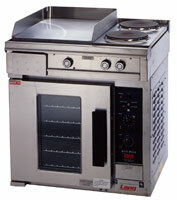 Lang R30C-APB Maximizer Range R30C Series 30quot w Hot Plate and French Plate- Electric - New Electric Ranges | BakeryEquipment.com is your bakery equipment source! New and Used Bakery Equipment and Baking Supplies. Maximize your cooking space with Lang's 30" Electric Oven and Electric Range Combinations. 30” Wide Heavy-duty Electric half size oven (EHS) base available.